« Rielle’s 15 minutes of fame are up. Can we go on to other things now? Please. Seton Hall University is the oldest and largest Catholic university in New Jersey. It also has been a basketball power, on and off, for the past 60 years. This year the Pirates seemed on the verge of returning to the elite of college basketball, posting a 19-13 record, including 9-9 in the Big East Conference, the nation’s toughest. The return was led by coach Bobby Gonzalez, who posted a 66-59 record over four years. But Gonzalez brought a mixed blessing to Seton Hall: the university often had more reason to be ashamed of the Pirates than to be proud of them. 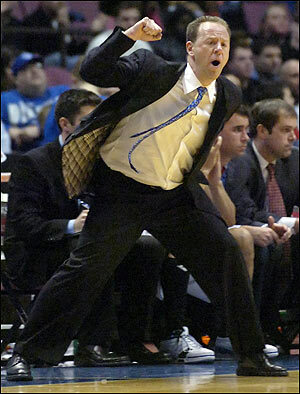 Gonzalez repeatedly clashed with everybody: his players, opposing players, his coaches, opposing coaches, game officials, and his superiors at Seton Hall. Players he recruited were charged with serious crimes. Tuesday it ended. In the afternoon a player Gonzalez had just kicked off the team was arrested and charged with first degree robbery and kidnapping. Later, in the opening minutes of the Pirates’ tournament game against Texas Tech, one of their starters was ejected for punching an opposing player in the groin. Then Gonzalez drew his seventh technical foul of the season. That’s enough to put Seton Hall on our short honor roll of universities (along with the University of Oregon and Texas Tech) that put behavior first, winning second. This entry was posted on March 18, 2010 at 3:12 pm and is filed under Ethics-general, Sports. You can follow any responses to this entry through the RSS 2.0 feed. You can leave a response, or trackback from your own site.